Russell + Mills has a long history of passionately working with public gardens throughout the U.S. The experience illustrated on this site includes work competed by Craig Russell and Paul Mills as part of Russell + Mills Studios, as well as the work of Craig Russell while with EDAW until 2007. During this time Craig played an instrumental role in project management and design for over eighteen public gardens. As an Australian native, Paul Mills' experience with hospitality oriented gardens and high end residential gardens in the Asia-Pacific region brings an international perspective to the firm's work. The Gardens on Spring Creek began with a Master Plan developed in 2002, where a portion of the plan was implemented including entry area, drop off and parking. Following this work, Russell + Mills Studios was hired to implement subsequent phases including amphitheater, undaunted xeriscape gardens, specialty gardens and natural gardens. Parking and access was designed to separate vehicles and pedestrians with a drop off for elderly visitors and schoolgroups. Fundraising graphics were successfully used to raise over $2.1M . The master plan concentrates on designing the central four-acre campus, which will contain the Education and Visitor Center building and surrounding display gardens. The gardens reflect Maine’s unique character and strive to highlight the site’s extraordinary natural features, which include rock ledges, water views and large mature trees. Most significant will be the Hillside Garden, Garden of the Five Senses, Rose Garden and Great Lawn plantings, which will become distinctive centerpieces that celebrate coastal Maine’s botanical heritage, i.e., native plants as well as plants that are associated with Maine’s cultural and economic traditions. Project work includes Master Planning, Landscape Architecture and Illustrations for this 250 acre woodland garden and arboretum near Atlanta, Georgia. The design capitalizes on the variety of hills, ravines, watercourses and forest settings to create a tranquil setting with a variety of garden environments including a Children’s Garden, Wetland Marsh, Enchanted Woodland, Waterfall Walk, Native Plants Garden, and Asian Woodland. The project will disturb very little of the environment through its sensitive layout which works with existing topography and around existing rock outcrops and trees. Russell + Mills Studios were hired to create a master plan for the site of Two by Two Animal Campus, a non-profit organization that embraces education through animals. Russell + Mills Studios conducted a series of stakeholder workshops that defined the site’s program, interpretive/educational plan and the design direction and vision for the campus. The animal campus is located on a 200 acre site in the southern area of Wisconsin. The site is anchored by a campus of buildings that promote animal care and learning through domestic animals and wildlife animal habitats. Visitors can explore the property via a trail system that explores the incredible habitats found on the site. The extensive site program has been designed for families and children. The educational curriculum is supported by a variety of activities on site emphasized by play and experience. The Colorado State University Perennial Gardens completes the off-campus University Garden Arts District as the final component, complementing the existing Annual Trial Gardens and University Center for Performing Arts. The district encompasses the grounds of the historic Fort Collins High School and serves as an educational and entertainment amenity for the community. The Perennial Gardens provide an opportunity to showcase over one-thousand taxa that were relocated from the previous gardens at the site of the new on-campus stadium at CSU. The gardens provide a setting for these unique species and subspecies that are not commonly available in the Colorado nursery industry, but have proven to be successful candidates as low-water use perennials in Northern Colorado. The project also functions as a living laboratory for students in the Department of Horticulture and Landscape Architecture at Colorado State University for coursework and graduate studies. In addition to serving as an university amenity, the gardens provide an opportunity for community members to learn about new planting opportunities for their own properties, while showcasing plants in a memorable design. Through a combination of plant composition, designed experiences and thoughtful site planning, the garden serves as an example of Landscape Architect’s ability to create aesthetically pleasing, educational and sustainable landscape that contribute to quality of life and the environment. The garden was in need of reconstruction to meet new master plan and ADA requirements. Along with these requirements the major objective was to retain the garden’s original style, charm and the elements initially included for the Zellerbach Family who funded the project. The garden raises the appreciation of careful landscape design and aesthetics through a broad sector of society, and provides a place of peace and reflection. It sets an example for conserving diminishing resources, and preserves the detailing and style of the nouveau California landscape architects. This project includes new gardens that provide a cohesive framework for the Betty Ford Alpine Gardens. The new gardens emphasize education, local environment and community building. The first garden is the Alpine Plaza. This garden becomes a new hub, with entries to the Gerald Ford Amphitheater, Betty Ford Alpine Gardens, River Trail, Schoolhouse Accessibility Garden and Children’s Environmental Garden. The plaza contains elements of the local alpine landscape, such as flag trees, tundra plantings and limestone crags. The second garden is the Children’s Environmental Garden, which includes a miniaturized landscape of the Vail Valley. A kid’s trail ascends to a miniature Grand Traverse in the nearby Gore Range. In accordance with the garden’s educational mission, this child-oriented environment teaches and educates visitors about the local landscape vocabulary and environment, illustrating concepts such as plant adaptations and geology. IN PROGRESS. This project has only just begun, and we have recently completed our first workshop and kickoff. The project entails the restoration and rejuvenation of the lake for the garden while showcasing best practices in storm water management, while creating a memorable lake and creekside gardens and experience. Check back for updates as this exciting project develops. Russell + Mills Studios recently completed a master plan for the renovation for this 80 acre park in Denver, CO as part of a three year on-call contract with the City of Denver Parks and Recreation Department. One component of this plan included a demonstration garden for low-water use plants. The garden was developed to help communicate xeric design principles, attract a varied demographic to the park, and provide a restorative and tranquil place for park users. The garden is themed on distinct plant communities of the region and includes seating nodes as well as sculptural/educational features as interpretive elements. Craig completed a children’s garden design for the Naples Botanical Garden. Families will start their experience in the “Entry Court”, passing through an enclosure in a tunnel of sable palm trunks (the State tree), and entering a shady, natural clearing surrounded by ‘wormy’ ledge rock and containing springs and shallow pools of water to wade in. These pools will mist, squirt and effervesce unexpectedly to add to their playful quality. This water source will be used to describe the hydrology cycle and will suggest the importance of water in sustaining life as it flows outward through the garden. The purpose of the Morton Arboretum Children’s Garden is to provide a state-of-the-art educational landscape for children. Introducing children to many aspects of plant physiology, reproduction, ecology and aesthetics through both self-guided and mediated hands-on experiences is the intention of the plan. It begins in backyard, themed landscapes and transitions into wild, natural landscapes, allowing the child to move comfortably from the familiar to the unfamiliar. Children learn through play and self-discovery by touching, feeling, observing, experimenting and being immersed in the subject matter. Expanding their outdoor education in this way establishes lifelong, positive attitudes and knowledge about inquiry, stewardship, nature and landscape year after year. The project is located within the nationally significant Frederik Meijer Gardens and Sculpture park where one can see works conceived by renowned artists such as Leonardo DaVinci and Claus Oldenburg within a garden setting. The Children’s Garden provides a place for kids and families where interest and affection for plants, the natural environment and the arts can be developed synergistically. A series of playful, child-scaled landscapes are created with integrated artworks. This theme strongly relates to the institution’s unique mission concerning appreciation, knowledge and enjoyment of gardens, sculpture, the natural environment and the arts. The Hershey Children’s Garden opened in June of 1999 and within the first year, more than doubled the Botanical Garden’s visitation. The garden is designed to be an interactive, playful garden where children can learn about the value of plants, gardening and the interconnections of nature. Designers worked with staff and a design committee during workshops to develop the statement of purpose, list of objectives, list of program items and the overall layout. The 30,000 s.f. garden is organized into three main sections – Entry Area, Ecological Area and Horticultural Area. The kid-scaled entry is flanked by rabbit statuary, establishing the garden as a province for children. A highlight of the Ecological Area is the open, rustic tree house with ample decking built around two existing tulip trees. Other natural landscape elements in this section include pond, wetlands, stream, peat bog, coppice, hill, forest, bird blind, stone cliff and cave. The Horticultural Area features growing areas, tool house, hand water pumps, playhouse with sod roof, international plants garden, worm and compost bins, and a scrounger garden displaying plants in a variety of found objects, including old shoes and musical instruments. Craig worked on the design and construction documents for this 1-acre Children’s and Family garden. The garden has become a popular destination for families throughout the region. A variety of spaces including caves, play structures, interactive gardens and a greenhouse accommodate families and provide activities and experiences relating to local Utah culture and natural history. The garden is set within the existing topography of the Salt Lake Foothills and relates to its forms, colors and vegetation. Norfolk, Virginia is a community rich in ethnic diversity and is the North American headquarters for NATO. The overall design philosophy for the Children’s Garden at the Norfolk Botanical Garden is to introduce and interest children in plants by way of global themes. Children explore the connections between plants, international culture and environment using their natural curiosity and instinct to play. The garden introduces visitors to the global theme in a forecourt/entry space which allows visitors informal perimeter seating and features a central United Nations Parterre. A central plaza and global garden is the primary organizing feature of the garden and contains a walk-through map of the world, with continents, bioregions and wet oceans. Children learn geography, pattern recognition, plant communities, and route finding here. A maze-like tunnel surrounds the plaza and offers entry into gardens that represent six continents of the world and feature typical plants of representative biomes, interactive artifacts from selected cultures, time zone sundials, and passport stamping stations. When the Quad City Botanical Center (QCBC) was first envisioned, the founders knew a children’s garden would be an integral component. The designers worked with members of the QCBC’s Children’s Garden Design Committee to select concepts and design elements for the garden. Using various aspects from Quad City’s history, such as agriculture, the early Native American influence, river and train transportation, eagle’s nesting habitats and more, a design resulted that would not only educate children in the area’s history, but foster enthusiasm for plants and nature. The Olson Family Garden is an 8,000-square foot, 8th floor rooftop therapeutic garden for Children’s Hospital at Washington University Medical Center in St. Louis, Missouri. It had a construction cost of $1.5 million. Provide a place of solace for very sick children and their families, away from the stresses of the hospital environment; Provide opportunities for children to connect with nature, such as smelling plants, interacting with sculpture, touching water, etc. ; Provide opportunities to increase a child’s interest level through discovery; Provide a sense of acceptance of life’s rhythms through images of healing and wellness; Provide families with a private place to converse with care-giving staff or simply reflect in quiet solitude. 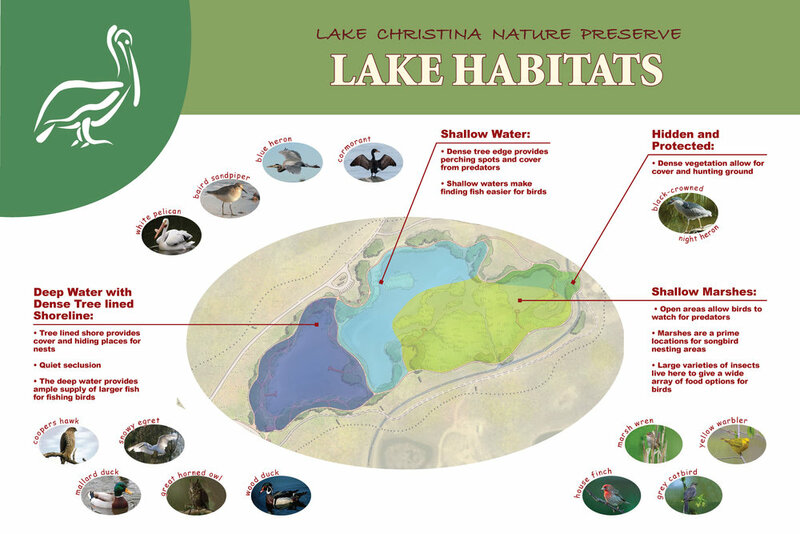 Russell + Mills Studios developed an interpretive plan for the Lake Christina Nature Preserve that showcases the unique and varied plant/animal habitats along the shoreline. The intent is to create a visitor experience that immerses visitors into each habitat zone along a perimeter and interior trail. The trail design was developed by Russell + Mills Studios in response to the interpretive plan. Signage along the trail provides visitors with a destination and assists with an overall understanding of this unique site. The project represents a design process that we embrace - a wholistic approach to interpretive planning and spatial planning/design. Thank you for visiting our Garden Experience website. Russell + Mills is located in Fort Collins, Colorado. Please write to us using the form below. We know we can provide memorable and inspiring places for your garden.